Steve Yzerman remains heavily involved with the Tampa Bay Lightning in his role as senior adviser to general manager Julien BriseBois, but it remains to be seen what he will do when his contract expires after this season. "I talked to him midyear to see where his head was at," BriseBois said at the annual March meetings of NHL general managers Tuesday. "He said he still wanted to give it some thought, and we'd revisit after the season." Yzerman stepped down as GM on Sept. 11 after eight seasons, saying it was becoming difficult to do the job the way he felt it needed to be done and also be with his family in Detroit. He spent 26 seasons with the Detroit Red Wings previously, 22 as a player, four in the front office. "I know he's around, because I'm there," BriseBois. "But when I talk to people, they don't seem to grasp how around he's been all year. What’s Next For Steve Yzerman? It’s believed Yzerman will fulfill the balance of his contract as a senior advisor in TB. #tblightning owner Jeff Vinik had been hopeful + optimistic early in the summer to sign Yzerman to an extension. I asked Yzerman during playoffs and he said “Working for Jeff has been fantastic. It’s a tremendous position and I’m grateful to have it." "No matter what moves you make, there's no guarantee that you're winning the Cup. I do know that at the trade deadline, any deal you make you're paying more than at anytime during the season. I weigh any opportunity with what it's going to cost. "I can give up five first round picks and every prospect we have and it still won't guarantee the Stanley Cup." -Steve Yzerman, GM of the Tampa Bay Lightning. Joe Smith of the Tampa Bay Times has more. Yzerman, who has won four Stanley Cups and three Olympic gold medals as a player and executive, has been credited with much of the Lightning’s sustained success the past eight seasons. Yzerman arrived in Tampa in 2010 after serving in the Red Wings’ front office for four years and guiding Canada to Olympic gold in 2010 as the team’s executive director — a feat the country would repeat under him in 2014. He found success quickly in Tampa. Everything he touches seems to turn to gold, and we don’t just mean those two Olympic medals Canada won when Stevie Y ran things. Take Jo Drouin. Please. Puck’s bad boy, a precocious talent, went to the brink with Yzerman. Drouin wanted to go back to Montreal, his hometown. Yzerman eventually made the deal. In return, the Lightning picked up 19-year-old Mikhail Sergachev. Drouin and the Habs are struggling. Sergachev has more goals than Drouin and more points than anyone on Montreal. He looks like a generational offensive defenseman. Only Yzerman could deal a guy to where he wants to go and still make a killing. Classic Stevie Y. "You try to make decisions," Yzerman said. "I rely heavily on our scouting staff on all the decisions we make. We were looking for an offensive defenseman, a puck-moving defenseman. Those players are hard to find. We gave up a good young forward to get what we thought was going to be a good young defenseman. We watched (Sergachev) in junior and felt like he was going to be a good pro player. And he is." This is the same Yzerman who replaced Ben Bishop, the best goaltender in Lightning history, with Andre Vasilevskiy … the best goaltender in Lightning history, league leader in wins. This is the same Yzerman who turned what could have been an offseason tempest into the summer of love. Like the signing of Nikita Kucherov in 2016 to a three-year, team-friendly deal. Kucherov, in turn, has been astounding this season. The 24-year-old leads the NHL in goals and points. He looks like the league MVP to me. But maybe the NHL's GMs are finally wising up to long-time league executive Brian Burke’s long-standing stance: 'Why do so many of us blow our brains out when there’s only one Stanley Cup parade?' Or perhaps the salary cap gives teams little to no wiggle room. Probably more of the latter. The trade deadline is run by bean counters now, with every deal sporting a 'retaining salary' component. Also, teams that waited until Wednesday got stocking stuffers — mostly late-round draft picks — for many of the players. Only two teams, the Minnesota Wild (Martin Hanzal from the Arizona Coyotes) and the Washington Capitals (Kevin Shattenkirk from the St. Louis Blues) traded a first-round draft pick for a rental player. They spent relatively high, and why not? They're the best teams in their conferences. But first-round picks, while always currency, didn’t move. This June's draft is billed as a lukewarm crop of prospects from the 15th to the 31st selection, according to many amateur scouts. The truth is the big winner at the trade deadline was Tampa Bay Lighting GM Steve Yzerman, who subtracted, not added. He somehow found a team, the Philadelphia Flyers, to take Valterri Filppula’s $5-million contract for next year when he would have had to protect him in the June expansion draft because he has a no-trade clause. "It's relatively quiet around the League for a lot of reasons," Yzerman told Fox Sports Sun play-by-play announcer Rick Peckham. "One is simply the cap. A lot of teams don't have the cap space. And another is, everybody is kind of in the fight. There's very few teams that would consider today and say, 'We're out of it … We're just going to start moving our assets.' And those teams need partners, and the teams at the top don't have the cap space and don't have the urgency to do anything, so it'll get closer to the deadline for us, or in the middle a little bit. "And we're trying to win. If I could do something that helped our team make a trade that identified a need for us -- not just for this year, but going forward -- I would do that and haven't been able to do that to this point and that's been going on, really, since the draft last year." -Steve Yzerman, GM of the Tampa Bay Lightning. Pierre LeBrun of ESPN has more. In Mitch Albom's latest work of fiction, a Christian God has decided to wipe hockey off the face of the earth. Such a notion might incite traditional fans of the sport to drop their gloves, while others turn to a more diplomatic debate. Albom just hopes he gets a good laugh from audiences when they see his play, Hockey, the Musical!, which opened Thursday at City Theatre in Detroit. Yzerman went all in to win this season. He had done enough right for Tampa Bay to take a run at the Stanley Cup again this spring, but enough wrong that if Stamkos had carried the Cup on a lap of the rink, it might still have been the last time he’d ever wear a Lightning sweater. But now, through a couple of unforeseeable bad breaks, Yzerman has busted out. His team will need a miracle every other night for two months to play for the Cup. And if winning can’t fix everything, neither will such a disappointing, desultory end. -Gare Joyce of Sportsnet where you can read much more on Yzerman and the Tampa Bay Lightning. The Lightning have been shopping winger Drouin since he made his request in November but GM Steve Yzerman isn't going to give him away which is why he's still in the Tampa organization. "He's an incomplete player but he's going to be a good player," said a league executive. "It's tough on a good team trying to break in young players. With a lesser team he may get more ice time but it doesn't happen that way." Several Eastern Conference teams -- including Montreal, Ottawa, Buffalo, New Jersey and Boston -- have made calls to Yzerman to see what the asking price is for Drouin but those teams aren't getting much in the way of a response from the Tampa camp. That's because Yzerman has no interest whatsoever in trading Drouin to an Eastern opponent and would prefer he heads somewhere West because the Bolts are convinced he'll be a regular in this league. The Ducks, Blues, Flames and Canucks are all looking for help at forward so you have to think they are in on this deal in some way, shape or form. The asking price is believed to be a similar player or prospect in return -- a top 10 pick or a legitimate top six forward or top four defenceman. The belief is the asking price from the Blues may be 19-year-old centre Robby Fabri and the deal could be even bigger than that. About 15 teams have called but the reality is only five or six have a realistic chance. Steve Yzerman talks with George Stroumboulopoulos about Steven Stamkos, Jonathan Drouin’s trade request and his relationship with head coach Jon Cooper. All that matters in the next 70 days on the NHL trade market is what takes places between Steven Stamkos and the Tampa Bay Lightning. When the Lightning captain was drafted No. 1 overall by the Bolts in the 2008 NHL entry draft, the organization posted billboards across town with the slogan “Seen Stamkos” plastered on it. The issue this season is nobody has seen the 25-year-old Stamkos sign a contract extension, and the clock is ticking. Set to become a UFA on July 1, Stamkos will control what kind of trade deadline day the networks in Canada are going to have on Feb. 29, because if he hasn’t signed a contract with the Bolts by then, GM Steve Yzerman will have to decide what his next move is going to be. If Stamkos isn’t signed, the speculation will be on high. To make matters more interesting, Stamkos has a ‘no move’ clause, so he controls his own destiny if he decides to sign there. Tampa’s captain is an unrestricted free agent next July 1, barring a contract extension. Last week, while discussing the blood clot that will keep Andrei Vasilevskiy out of the lineup for up to three months, Lightning GM Steve Yzerman told The Tampa Tribune’s Erik Erlendsson there was nothing to comment on at this time. The obvious hurdle is the contract negotiation, with Stamkos expected to be in the $10.5M AAV range occupied by Patrick Kane and Jonathan Toews. It’s difficult to tell where things stand right now because none of the principals are talking, including Yzerman, agent Don Meehan or Stamkos himself. But according to a couple of sources, there are other things at play. Stamkos prefers to play centre, which creates a top-six logjam with Valtteri Filppula and triplet Tyler Johnson. It sounds like the Lightning would prefer Stamkos to play on the wing to ease that issue. From what I’ve been told, the discussions were professional, but both organization and player remain searching for common ground. The second is how the Lightning see the future. By the end of the 2016-17 season, they must determine long-term plans for Ben Bishop, Victor Hedman, Johnson, Alex Killorn, Nikita Kucherov, Ondrej Palat and Stamkos. Yzerman said in June signing Stamkos was his No. 1 priority this summer. Your third-grade science teacher will remind you that, technically, he’s got two more weeks. Even if it doesn’t happen by then, there’s no reason to believe Yzerman’s desires have changed. Watching from above ice level gives Lightning general manager Steve Yzerman a helpless feeling. Players prepare to take the ice, coaches game plan and scout the opponent looking for any advantage to exploit. Yzerman, meanwhile, sits around on game days just waiting for the action to start. “It’s hard to sit and watch without having much of an impact this time of year,” Yzerman said. Yzerman’s impact already has been made. After Tuesday night’s series-clinching 4-1 win against Montreal, the Lightning are preparing to play in the Eastern Conference finals against the Rangers. Game 1 is Saturday in New York, It marks the second time in Yzerman’s five-year tenure the team reached the conference finals. In 2011, Yzerman’s first season with the franchise, a team led by holdover franchise icons Vinny Lecavalier and Marty St. Louis and stop-gap veterans such as Dwayne Roloson and Sean Bergenheim reached Game 7 of the conference finals at Boston. This time, the Lightning are tailor-made by Yzerman. “Back in the 2011 playoffs, we were all relatively new and didn’t know what to expect from our team,” Yzerman said. -Steve Yzerman, GM of the Tampa Bay Lightning. Erik Erlendsson of the Tampa Tribune has more from Yzerman regarding the Bolts season. In the spring of 2010, new Lightning owner Jeff Vinik zeroed in on one name to fill the vacant role of general manager — Steve Yzerman. After some persistence on Vinik’s part, Yzerman decided the time was right to leave the Red Wings organization — he was a Hall of Fame player with Detroit and worked alongside general manager Ken Holland for three-plus years — and lead the Lightning front office. Now entering his fifth season with the Lightning, Yzerman has almost completely remade the organizational roster heading into the 2014-15 season. Gone are Vinny Lecavalier and Marty St. Louis, the last two holdovers from the 2004 Stanley Cup championship team still with the Lightning when Yzerman took over. Other core members when Yzerman took over also have left — Ryan Malone was bought out this summer; Teddy Purcell, Steve Downie and Nate Thompson were traded, and Mike Smith left as a free agent. In fact, in the entire organization — not counting European-drafted players — there are only seven inherited players still in the system from when Yzerman assumed his role before the 2010-11 season: Steven Stamkos, Victor Hedman, Alex Killorn, Richard Panik, Mark Barberio, Luke Witkowski and goaltender Jaroslav Janus. My own problems with Yzerman started as a result of him mistreating my teammates. He was abusive to linesmen, and it made my protective instincts kick in and tell him off in no uncertain terms. The spark was lit after he belittled and verbally abused longtime linesman Mark Pare on an icing call in Detroit. It went way beyond simply yelling about a blown call. He treated Mark and other officials like they didn't even belong on the same ice as he did. My next run-in with Yzerman came as a result of a disallowed goal in Minnesota. The dialogue won't be repeated on a family-friendly blog but suffice to say he wasn't a big fan of my style nor I of his. He made it personal and then escalated it when he elected to gripe to the media about me. Retired NHL referee Paul Stewart. Read more from Stewart at the Huffington Post. "It gives us some options," Lightning GM Steve Yzerman told ESPN.com Monday. "Really, prior to yesterday, other than trying to sign a backup goaltender, we really weren’t in a position to do anything at all. And we may end up doing nothing [Tuesday] other than signing a backup goaltender, but we’d like to explore [the free-agent market]." Yzerman pointed to possibilities both up front and on defense. "We’d like to get potentially a center or maybe a winger," said Yzerman. "And then, we have seven defensemen signed and we’d like to carry eight. Depending on fit and contract, whether it’s a really expensive guy or a low-end one-way, we’ll try to add one more defenseman." Preferably, Yzerman said, a right-handed defenseman. The Bolts GM would not discuss specific names but other sources have confirmed Tampa’s interest in UFA blueliner Matt Niskanen as well as veteran Dan Boyle, among others blueliners. The IIHF's press release continues, profiling each inducteee, and having Ruslan Salei inducted into the IIHF HOF in Belarus's capital is going to be a very emotional event. Yzerman, 48, On Tuesday took some time to share his thoughts on several topics, from his evolution as a general manager to the difficulty, or ease, depending on how you look at it, of maintaining his organizaional vision on the NHL level and with AHL Syracuse. On his contract extension: Four years have gone by very quickly. Initially, when I was excited about the opportunity and Jeff offered me the position, first and foremost was my meeting with him and how much I enjoyed talking with him and his vision of the organization, and that hasn’t changed to date. We’ve got a lot to do. We’ve made a lot of changes that you see on the ice and off the ice. We’ve got a lot of work left to do and as an organization as a whole and a team (we're) going in the right direction. I want to continue with the process, and I’m grateful to get the opportunity to continue. ''I hate them,'' said Snider, the Flyers founder. Reminded the Flyers reached the Stanley Cup finals during the last Olympics in 2010, Snider laughed. As the man most responsible for assembling Canada’s Olympic team, Steve Yzerman faces more pressure than any hockey executive in the world. And unless and until Canada wins a gold medal in Sochi, his selections for the team will be questioned and parsed and debated. It comes with the territory. But it’s crystal clear by his choices that the one thing you cannot question about Steve Yzerman is his integrity. Yzerman and his management team picked the 25 players they believe give Canada its best chance to win a gold medal and that group did not include his own player, Martin St-Louis. Talk about courage. It would have been very easy for Yzerman to overrule his management group and take St-Louis for the team. He could have easily justified it, saying that it was all about duos. After all, the team has Jay Bouwmeester and Alex Pietrangelo, who patrol the blueline together in St. Louis. It has Sidney Crosby and Chris Kunitz, Ryan Getzlaf and Corey Perry, Jonathan Toews and Patrick Sharp. He could have easily pointed to the tandem of St-Louis and Steven Stamkos, who is expected to be ready to play for Canada. Jaromir Jagr could always score goals -- and on this night, a bunch of other New Jersey Devils did as well. Jagr had a goal and two assists, and the Devils scored four goals in the third period of a 5-2 victory over the Carolina Hurricanes on Friday night. In his previous game, he passed longtime Pittsburgh teammate Mario Lemieux. Next up: Mark Messier at 694. "I don't really chase anything," Jagr said. "I enjoy my teammates and my linemates. I enjoy the game, the way we play. Our line, I like the way our line played. When I'm happy about our game, I know the goals are going to come. That's why I don't really worry about it," he added. "If there's no chances to score goals, then I would start worrying about it." "Yes, I believe a player should get a game misconduct for fighting. We penalize and suspend players for making contact with the head while checking, in an effort to reduce head injuries, yet we still allow fighting. "We're stuck in the middle and need to decide what kind of sport do we want to be. Either anything goes and we accept the consequences, or take the next step and eliminate fighting." The issue of contract insurance for NHL players participating in Olympic orientation camps is such a problem in terms of cost that Sport-Express's Andrei Kuznetsov reports that even the Russians aren't skating today or tomorrow in Sochi, but ahead of the Canadian Olympic orientation camp in Calgary from Sunday the 25th to Wednesday the 28th (and the U.S. camp in Arlington, VA on the 26th and 27th), and as you might expect, Hockey Canada's takng some press flak for not being able to scrounge together the funds to be the only hockey federation that managed to get its orientation campers on the ice (the Swedes, Finns, Czechs, Slovaks, Swiss, etc. did not skate). Ligntning GM Steve Yzerman met the media in Winnipeg to talk about the firing of Guy Boucher and the plan moving forward. Going off this season, anyone who wants Steve Yzerman and Mike Babcock in charge of Team Canada for Sochi is in need of therapy. Detroit, You Can’t Have A Legends Plaza Without Yzerman! The Detroit Historical Society celebrated the opening of its own version of the Hollywood Walk of Fame Wednesday morning, showcasing the handprints and signatures of almost two dozen Detroit icons. Detroit Legends Plaza had its official ribbon cutting ceremony just outside the Detroit Historical Museum's southwest entrance in Midtown. The plaza, located at 5401 Woodward Ave., features 22 mounted display boxes marked with the mitts and autographs of Detroit celebs including: Mayor Dave Bing, former Lions running back Barry Sanders and boxer Tommy "The Hitman" Hearns. Speaking from personal experience as a St. Louis Blues fan, the 1995-96 Red Wings broke my heart. More specifically, Steve Yzerman, Game 7, double OT. I guarantee that if you mention that phrase to any Blues fan, you will get a pained groan in response. And, of course, this is the one highlight they always show on NHL commercials: Yzerman's unreal slap shot from just inside the blue line, the puck somehow eluding Al MacInnis and Murray Baron and, most obnoxious of all, Jon Casey's shoulder. And then his euphoric (and gag-inducing) sissy-leap down the wall. Ugh. -David Walton of ESPN when discussing the greatest NHL team of the modern era. “I hope he (Lidstrom) does [retire], and I love him. I can’t talk about other teams’ players, but I admire him and I think he is one of the greatest. He is brilliant in how he plays. -Doug Wilson, GM of the San Jose Sharks. More reaction from Corey Masisak of NHL.com. If Steve Yzerman has his way, the NHL will reinstate the center red line next season in order to promote the play-making he says the game sorely lacks. Reinstating the red line and, by consequence, the illegal two-line pass is just one of the issues to be discussed at the GM meetings Monday through Wednesday in Boca Raton. It piques Yzerman’s interest even apart from the discussion about how reinstating the red line might reduce injuries caused by the speed of the game. The honeymoon is over for Steve Yzerman in Tampa Bay. Now comes the hard part. Reality finds his Lightning in 12th place in the Eastern Conference, currently out of the playoffs, no longer everyone’s favourite hockey success story. And all that said, this is brand new territory for Yzerman, the hockey executive. Losing isn’t something he knows or will accept. His first year in Tampa turned out to be something close to pure magic. The GM of the Tampa Bay Lightning returns to Detroit. During a timeout in the first period of tonight’s game between the Lightning and Red Wings, the public address announcer at Joe Louis Arena will introduce Steve Yzerman. A shot of Yzerman in his seat will be shown on the scoreboard, which then will run a video tribute; at least that is the plan, the Red Wings said. It is a display Yzerman probably could do without. But in a way it is. Earlier this afternoon, some NHL 12 fans on the internet found a new Legends video, posted exclusively on the EB Games (now GameStop) webpage for NHL 12. However, the video was kind of “hidden”, thankfully over the time it took for me to write this update, there has been a new link to this new video released by EA Sports in an exclusive with GameStop’s official site, which makes it much easier to find, and is of much better quality that the original one that was found. Read on, as I’ll provide a link to this new video ( UPDATE - Days later, I finally have the video included in this post ), which reveals several bits of juicy new info on the Legends, including what their team uniforms look like, some info about unlocking them, and best of all, what their overall ratings will be! Also included in this update is some additional news about the Jets’ new sweaters potentially not being in the game upon release, and some new quick-clips about HUT and the EASHL. 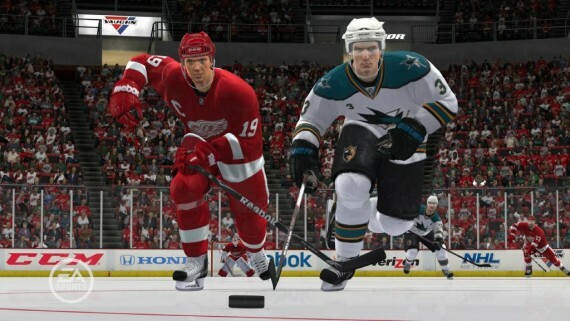 Click here for the full sized screenshot via EA’s NHL 12 Twitter account. Alright, I’m sure I’ll take some heat for this, for multiple reasons, but mostly because it goes outside my blog’s rage of coverage which is listed as “everything but the NHL”. In my defense though, this isn’t news; it’s just a retrospective look at some hockey history. Plus, ever since the recent retirement of Chris Osgood, I’ve been thinking about writing about this, and providing my personal perspective on what I feel is one of the most historic games in Detroit Red Wings franchise history, at least among the games that have been played in my lifetime (1987 to present). As a young kid growing up in Metro-Detroit, I started casually watching hockey in 1991 - mostly the Red Wings; although I soon developed a love for the Boston Bruins as well, for some unknown reason. Once I watched my first hockey game, I instantly became a fan of the sport, as I found it to be far more entertaining and exciting than football, baseball, and basketball. I quickly learned how to skate and then starting playing hockey, but I still wouldn’t consider my young self much more than a moderate fan of hockey… until May 16, 1996… when St. Louis played Detroit in Game 7 of the Western Conference Semi-Finals. “I talk to general managers on a daily basis and get asked a lot, ‘How are you making out?’ But that’s about all,” Yzerman said.